The beeswax comes out of the molds beautifully. I made my first beauty product from the wax, mustache wax! A musician from the Phinney Farmers’ Market was complaining that he has trouble buying mustache wax that he likes. I made some for him as a prototype. 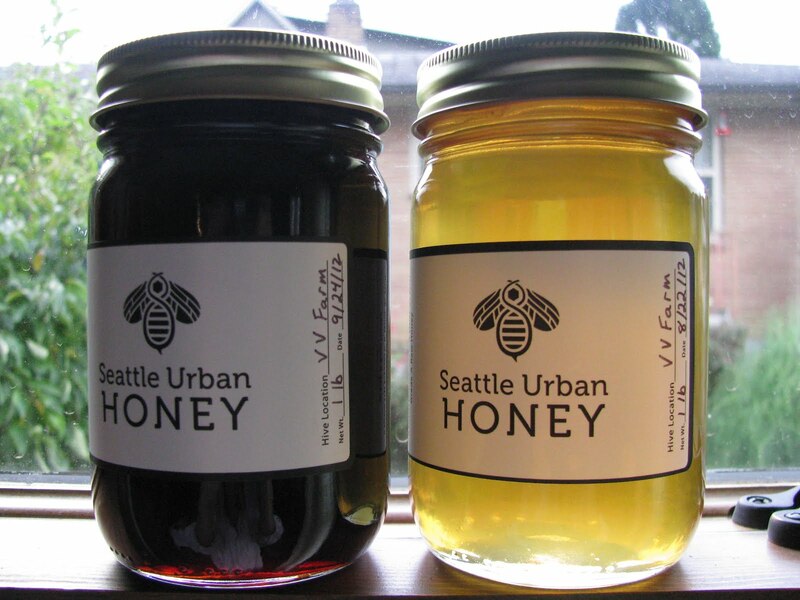 The two jars of honey above were harvested from the same 7 hives about one month apart. The lighter honey is blackberry honey and the darker honey is buckwheat with maybe some Japanese knotweed. We know the bees were in buckwheat because the farmer at the farm where we have our hives had planted buckwheat as a cover crop. We guess Japanese knotweed because it is blooming during August. The dark honey has a rich, fruity, plum like taste. The lighter honey has a clover and melon flavor. 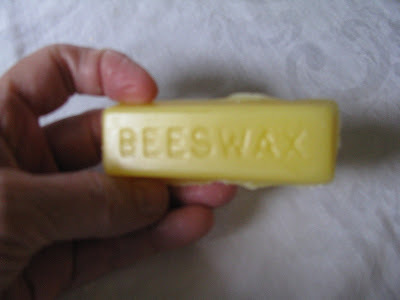 I invested in some beeswax molds so that I could market the beautiful beeswax that I am accumulating. When we harvest honey, we cut the wax cappings off of the frames in order to extract the honey. 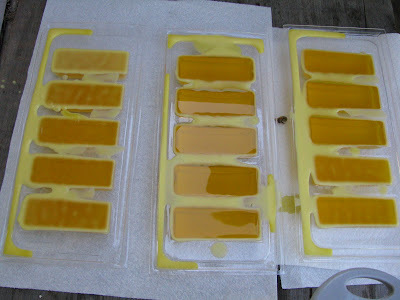 The wax cappings go into a solar wax melter (see earlier blog post: Bee Log 44: July 6, 2010 ). The wax is filtered through cheese cloth and collected in metal pans. I remelt the wax in a rice cooker purchased at Goodwill and pour the wax into the molds. We will be at the Phinney Farmers’ Market today, Friday, September 28 and October 5. We will be at the Queen Anne Farmers’ Market on Thursday, October 11. Come taste our honey.